Rick's Pocono Blog: The Great Outdoors in the Poconos! Come and enjoy yourself at The Francis E Walter Dam! This is a Park located in Lake Harmony in the Northeastern Region of Pennsylvania known as the Pocono Mountains. Take a walk through and breathe in the Fresh Mountain Air from the Lehigh River and the surrounding Trees and wildlife. There is An 1,800-acre project, with a small 80-acre reservoir but no Corps-operated recreation facilities. There is a boat launch area (no ramp), and there is a 10 hp limit. Picnicking, hiking and fishing are available, as is hunting, in season, on adjacent Pennsylvania Game Commission lands. 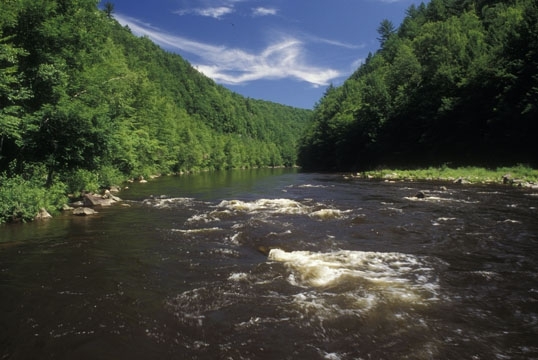 The Lehigh Gorge State Park awaits all of the Pocono Mountain Travellers! This park goes a little unnoticed in the Poconos. You may find yourself hiking or biking through the trails and stumble upon all kinds of wildlife and natural beauty.There is Spectacular Scenery all across the Gorge.The 25 Mile downhill grade from White Haven to Jim Thorpe makes the Trail popular with cyclists who use various ways from the Jim Thorpe area to reach the White Haven trail for an easy downhill pedal. Miles of Hiking Trails run all through out the Mountain having State Parks including Tobyhanna State Park, Gouldsboro State Park, Hickory Run Forest, and much more. The Sun is Shining and the Fish are biting! Fishing is one of the biggest Recreational Activities in the Pocono Mountains with the many Bodies of Water that run through the Mountain. Some Pocono Communities have their own Boat Launches and offer Sailing, Water Skiing, Canoeing, and much more. The Lehigh River running straight through The Lehigh Gorge!